Mikhail Prokhorov has effectively shuttered the Yo-mobile project to produce a hybrid vehicle. The Russian billionaire has sold off the technologies developed for the gas-electric car to the state. More than 200,000 orders had already been placed for the Yo-mobile. The project to produce a hybrid Yo-mobile vehicle, which was launched to great media fanfare in 2010 and has collected more than 200,000 pre-orders, has been effectively shut down. Russian billionaire Mikhail Prokhorov has handed over all the technologies to the state for a nominal price of 1 euro ($1.37) and intends to sell the production facilities in St. Petersburg. Russian oligarch Mikhail Prokhorov has decided not to run for election to the Moscow City Duma. "I am not considering myself as a candidate for the Moscow City Duma," he said on the Vesti FM radio station on Tuesday. 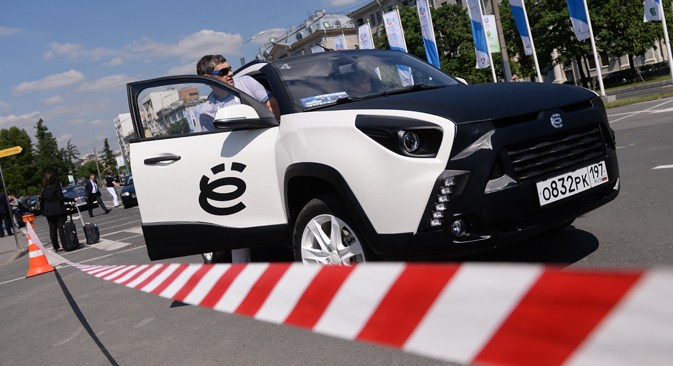 Prokhorov's company Onexim has decided to sell the business to the state research and development automotive institute NAMI, explaining the decision by a dramatic rise in the price of manufacturing equipment due to the falling ruble and a slump on the car market. Onexim’s investment director Valery Senko has told Kommersant that "the situation on the Russian car market and the overall situation in the economy have changed considerably; the depreciation of the ruble has pushed production costs up." Since it was planned to purchase most of the manufacturing equipment abroad, this has had a serious effect on the financial viability of the project. Since 2010, "the parameters of the project have changed, and its budget could [now] reach 450 million euros ($620 million)," with "several hundred million euros" already spent on research. Against the backdrop of declining demand, the efficiency of the project has come under question. Therefore it has been decided to transfer the project, along with all the work that has already been completed as part of it, to the state. In December 2010, Prokhorov presented three models of the gas-electric vehicle under the Yo-mobile brand: a hatchback, a truck and a crossover. The vehicle was marketed as an environmentally friendly innovative budget hybrid capable of running on petrol or natural gas, as well as on an electric engine. Its price was expected to range from 350,000 – 500,000 rubles ($8,500 to $15,000). Initial production capacity was planned to be 20,000 vehicles a year. The budget of the project was estimated at 150 million euros, with the first cars expected to come on the market in May 2012. A total of 215,000 pre-orders had already been received for the hybrid vehicle. In 2011, the Yo-mobile manufacturer signed an agreement with St Petersburg to build a car plant there, but its launch date kept being pushed back and the project has now been shelved indefinitely. According to Kommersant sources, due to rising costs the project "has in effect become loss-making" and "the transfer of the technologies to the state is the most elegant and acceptable option.” They point out that in the course of the work "there arose numerous unexpected day-to-day problems", pushing the price of the Yo-mobile up to $30,000, which "would have affected the whole concept of an affordable Russian-made vehicle.” "In the end, it was decided to freeze the purchase of the main production lines and then to withdraw from the project altogether," a Kommersant source explains. Kommersant's market sources estimate the cost of developing a large universal platform for a Western manufacturer at $1-1.5 billion. According to unofficial reports, the electric vehicle platform for the U.S. Tesla project cost about $700 million. An industry source told Kommersant that in the case of Yo-mobile, things did not reach the stage of negotiations on the price of the intellectual property but, in his estimates, the talks could have started from a figure in the region of $200-300 million. Chinese manufacturers, according to him, would have paid more, while American and European ones could have bought designs for an individual important unit for about $200 million. "We have received offers from foreign companies to sell our technologies, but a decision has been taken to keep them in Russia," says Valery Senko. Deputy Industry and Trade Minister Alexei Rakhmanov has told Kommersant that the ministry and NAMI were grateful for the technology transfer. "We'll analyze what they have done and then we'll decide in which projects these ideas and designs could be used," said Rakhmanov. Lighting:In December 2008, the Onexim group, together with the state corporation Rosnano, launched a new project to establish the production of light-emitting diodes in Russia based on a unique technology. As part of the project, Onexim bought the company Optogan, which owns the technology. As of 2012, the business was loss-making. Media: In April 2008, Mikhail Prokhorov and Vladimir Yakovlev, the editor-in-chief of Kommersant,founded a media group called Zhivi! The plan was to set up a media holding company with a large set of different assets, including a magazine, a website, an events management company, a club, a newspaper, a TV channel, children's projects and others. In October 2008, Zhivi! 's first project, Snob magazine, was launched. It was followed by a multimedia (a TV channel + website) project promoting healthy lifestyle, alongside a weekly newspaper called F5: The Internet as a Lifestyle, which was launched in February 2009. In early 2013, the holding company underwent restructuring and the media group Zhivi! ceased to exist as a legal entity. Two individual projects remain: Snob magazine and the Zhivi! TV channel. Sport: In September 2009, Mikhail Prokhorov filed an application to the National Basketball Association to purchase the New Jersey Nets club. The deal was approved in May 2010, and was worth $200 million. In the summer of 2012, the team moved to Brooklyn and was renamed the Brooklyn Nets. In the NBA 2014 season, the team currently ranks second in the Atlantic Division.